This is what it might be like…. I know what you’re thinking. “But I don’t want to cut down a piece of nature for my enjoyment.” I know where you are coming from. Really, I do. However, the trees need to be thinned out to reduce fire hazards and keep the forest healthy. By participating in this program, you are taking an active role in managing the forest BY cutting down the trees. The program is very carefully regulated with strict areas and rules for cutting down trees. (Please comply to keep Colorado pretty for everyone). 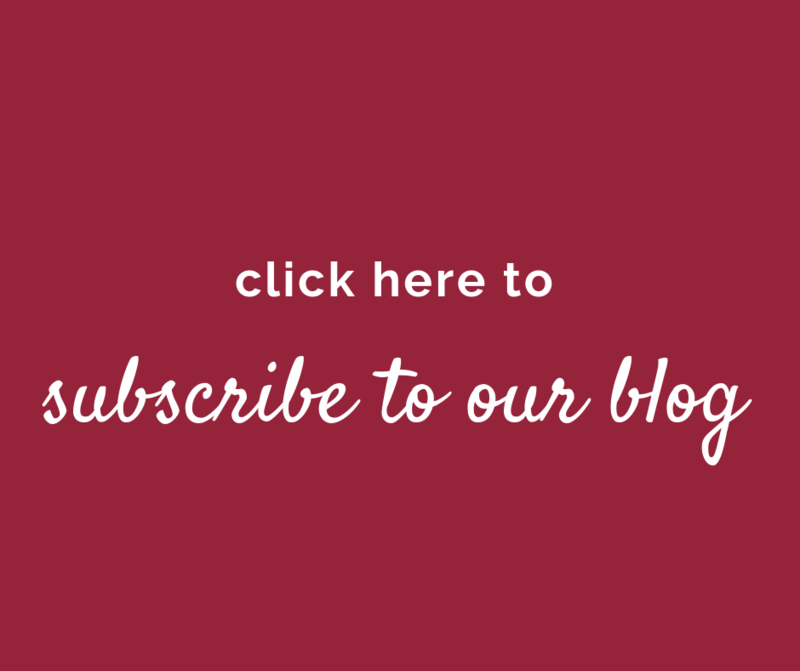 You might also be thinking, “Why in the world would you want to go out into the cold, hike through the woods, and cut your own Christmas tree that you then have to drag to your car or truck and tie to your car?” It does sound like a lot of work for what will probably be an imperfect Christmas tree. The trees tend to be a bit (or a lot) lopsided, have empty spots, and are just not as tight as the trees from the lot. But this program gives you an opportunity to spend time with friends and family during an otherwise busy season. Additionally, forest health is important. By removing these smaller trees you are contributing to the overall well being of the forest and reducing fire danger. Need more ideas for holiday fun? 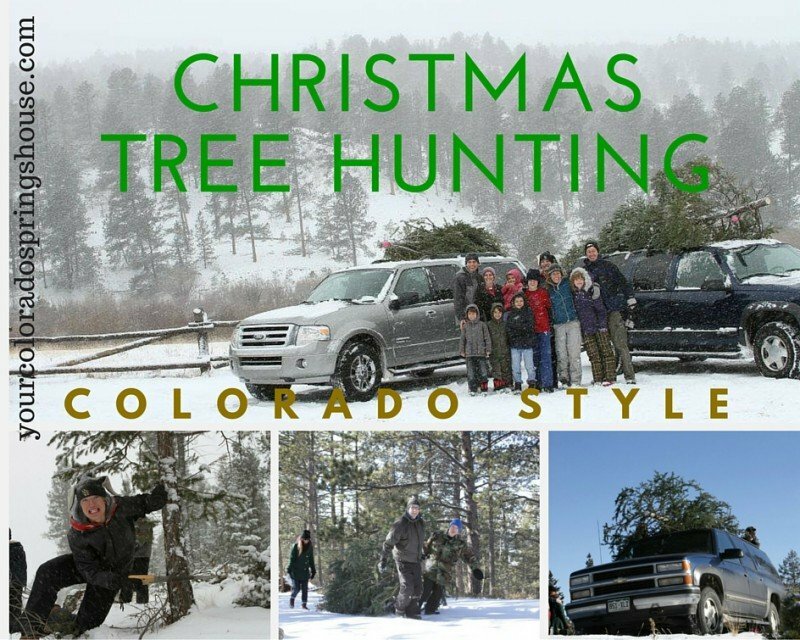 >> Check out our Top 10 Christmas Activities Near Colorado Springs post. Your don’t need a perfect Christmas tree. You don’t mind taking your (hopefully 4WD or AWD) vehicle through the backcountry. In fact, you’ve always been looking for a reason to really test it out. You think you can handle almost any kind of weather. You like great family time. You want to make cutting your own a Christmas tree a tradition. It has always been a family tradition and sometimes even a family adventure! When the kids were little, we kept the tree hunt pretty short. If it was very cold, the little ones would play in the snow only for a short time. I would stay with them while Tim went to look for a tree for us. By the time he came back, I had all 3 of the kids cuddling under blankets in the back of the Suburban and sipping on hot cocoa and having cookies. 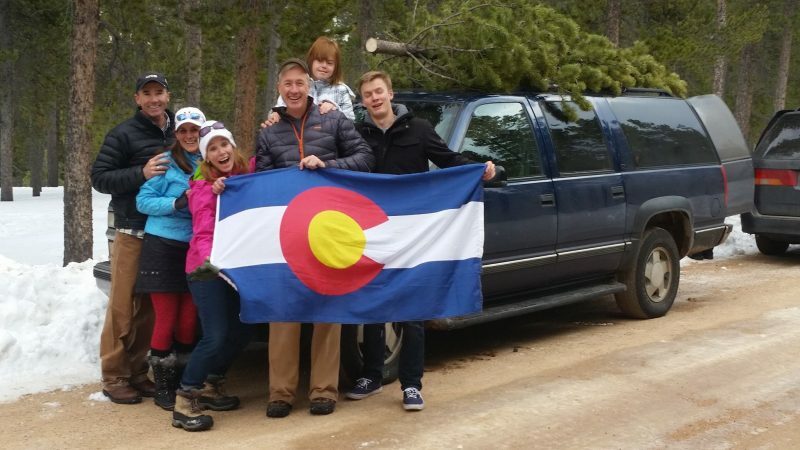 The doors of the truck were open and they watched (maybe laughed at us parents) as we loaded the tree onto the roof. Happily, we packed up and drove home while singing Christmas songs. Once the kids were older, we went as a group with other friends and their kids at similar ages. As we hiked through the woods, the kids would have a fun time just being kids. Who would find the better Christmas tree? Bigger? Better? Hot cocoa was still a part of the event. And we still sang on the way home. I don’t think we ever had a PERFECT tree. In fact, one year we stapled a few small branches from the bottom of the tree into some bare spots toward the top. You gotta do what you gotta do. You know, it really didn’t matter. This was about us, the season, and being together. Mission accomplished. Try it. 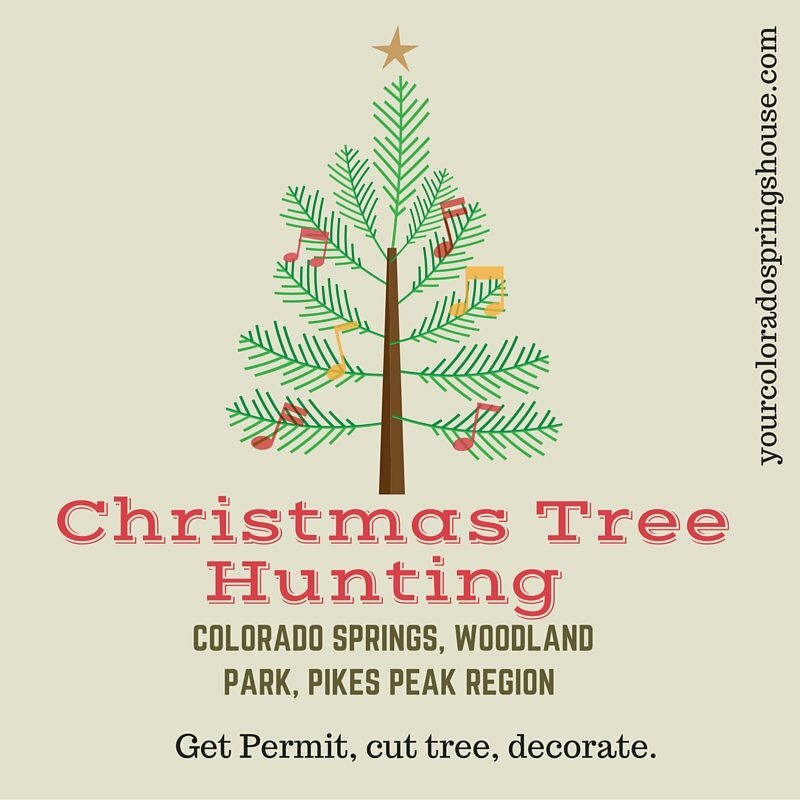 Most of my information in this post is about the Christmas Tree Program in the Pikes Peak Region. 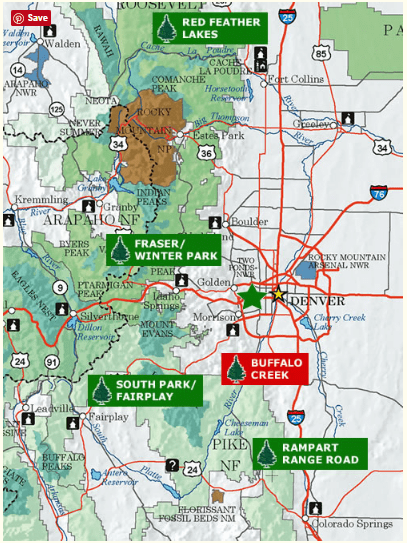 Find links to other regions in Colorado or in the Rocky Mountain Region at the bottom of this post. Permits are available November 26th-December 14th. The permit has to be attached to the tree and be clearly visible. Cutting areas are along Rampart Range Road and to the east and north of Woodland Park. They are very well marked. Please only cut trees within these areas. Here is a map of the designated areas. You will need 4WD or chains are required! They have had quite a bit of snow so be prepared to really use those chains. The evening and cold temperatures start early in the back country. Make sure you are done and heading out no later than 3pm. Your permit! ($5000 for cutting trees without a permit). Handsaw/ax and work gloves. Chainsaws are prohibited. Dress warmly for winter weather. Bring food, extra water, a shovel, a blanket, a first-aid kit, and a warm drink. Take a rope or bungee cord and tarp to pack your tree home. Create your own fire retardant solution for your tree.